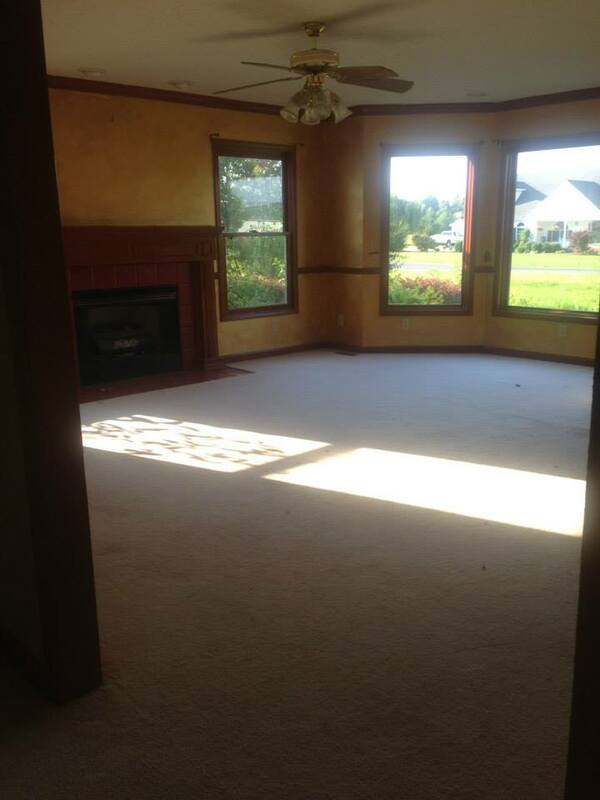 As the third room in the tour of our Re-fabbed home, I want to show one of the ugliest living rooms known to man. I wasn’t lying, was I? Well, once again- the ability to look past something can go a long way- remember that when you are faced in situations where the existing look is not what you would want! And you can usually get a much better deal when something is in this shape too~another bonus! Well, here it is today! TOTALLY DIFFERENT! We plan to move pretty soon, as this was never meant to be our “forever” home, so there are a few minor things such as window treatments that I decided to not do..but all in all, I am very happy with the space! I love gallery walls! 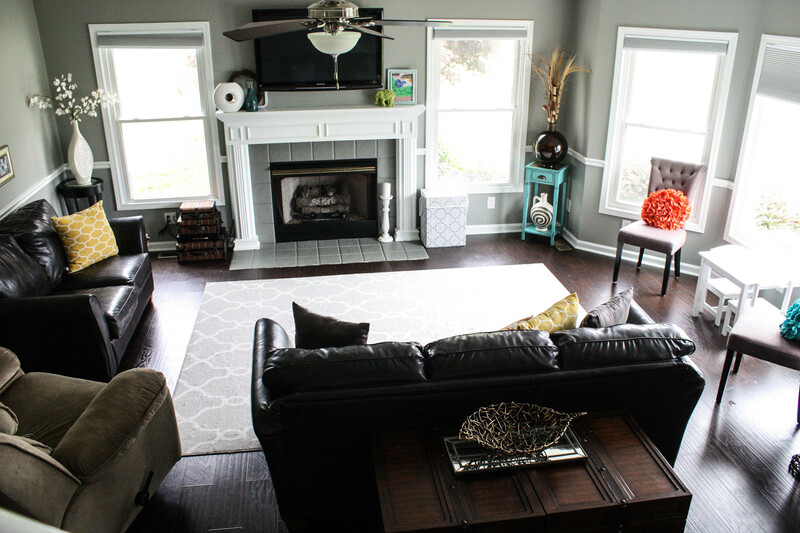 This one is not complete, but it is off to a good start…and we painted the fireplace, as well as the existing tile to give it a new, fresh look! 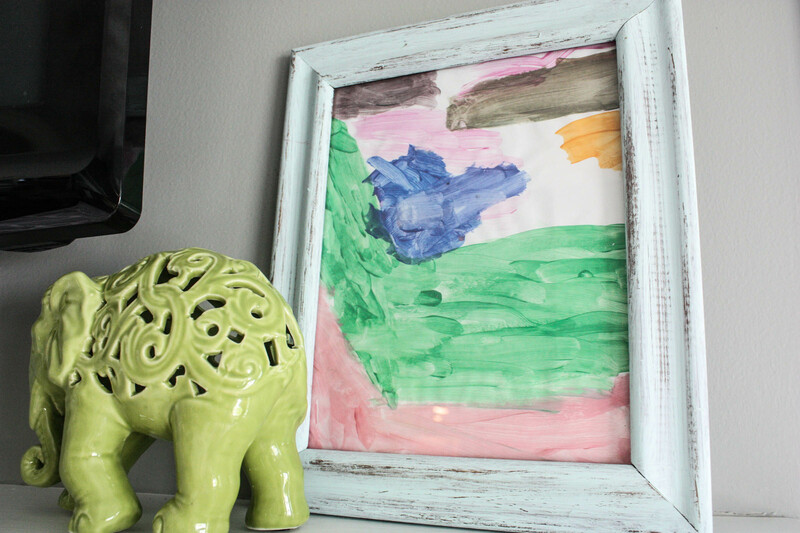 I love using my kid’s artwork around the house. It is just something that adds some color and sentimental value to a space. We made the coat rack out of pallets! I will have a tutorial on the blog sometime soon to show you how to do this simple DIY project. The living room in its entirety. 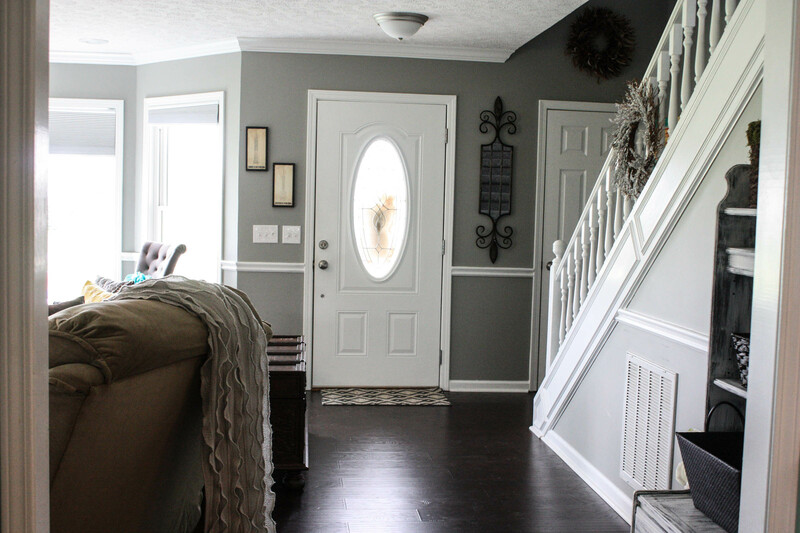 I love the gray walls because you can change your decor so easily, and it still goes perfectly. I am constantly changing things, so in a space like this- I had to have a very neutral wall color. This is a piece I found at a flea market for $20! 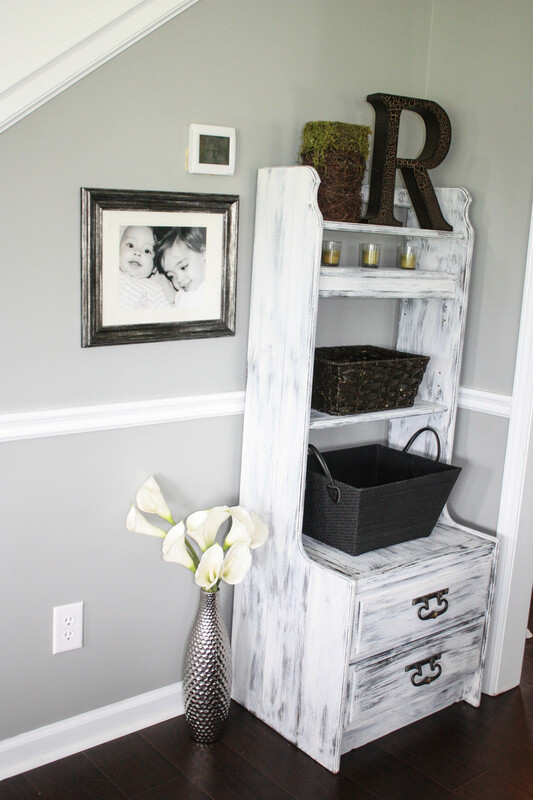 In about 20 min, I threw a quick coat of VM&D Vintage White chalk paint on, and it was done! I had been wanting shoe storage in my living room because for some reason, there were mounds of shoes EVERYWHERE, all the time! It was driving me insane. When I saw this, I knew I had the perfect spot…and it doing the trick quite nicely! Thanks for taking a peek at my living room! I hope in some way you were inspired to see beyond the ugly and see what could be! Cornice Boards- The Best Way to Dress a Naked Window! Um, wow. WOW. Ryan told me it was bad before but seriously, y’all worked some magic. I love it!!! Oh you did such an amazing job – it’s just gorgeous! 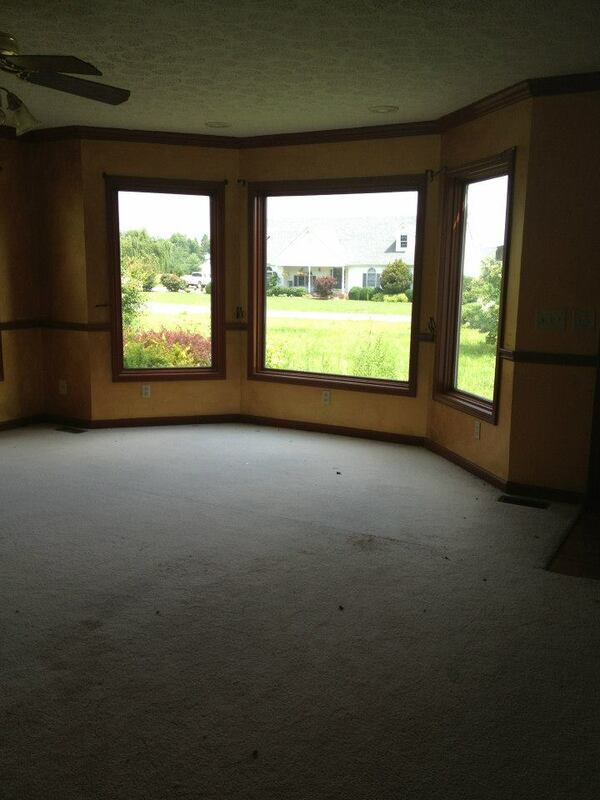 We bought a fixer upper last year ( 3rd one that would make your before look chic LOL – I’m nowhere near where you are yet ! This is truly inspiring ! Beautiful job ! Thank you so much! It takes a ton of work, but soo worth it! I am sure you would agree! I would love to see a pic of your before picture, if it was worse than this! HA! Wow!!!! What an incredible transformation! 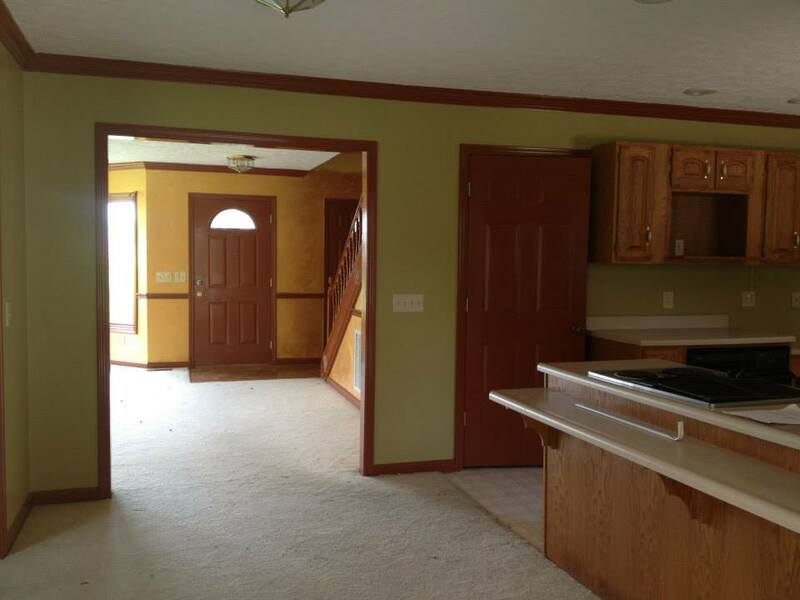 You can’t even tell the is the same space! I love your colour palette, bright and fresh but the wall colour gives the room a warm cozy feel. Stunning! Thank you, Gilly! It truly is hard to even believe it is the same place. 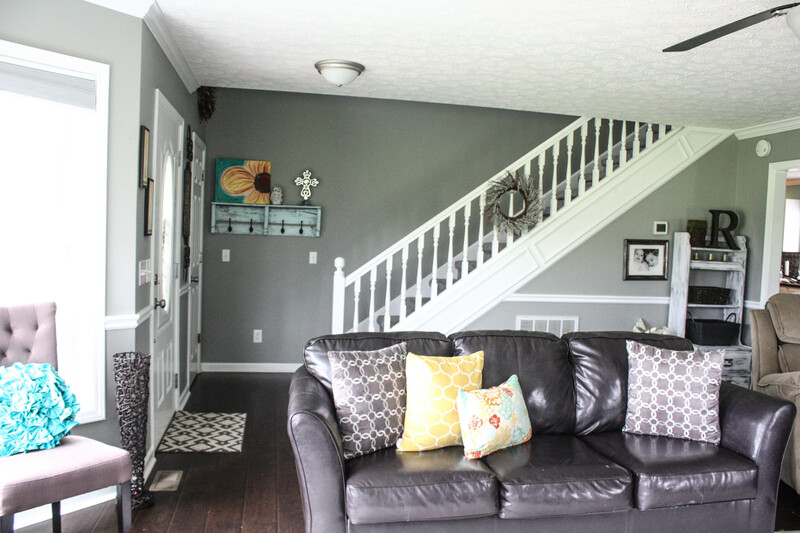 We definitely used a lot of gray around our home. It is so easy to decorate with, and like you said~gives it a warm and cozy feel 🙂 Thanks again. 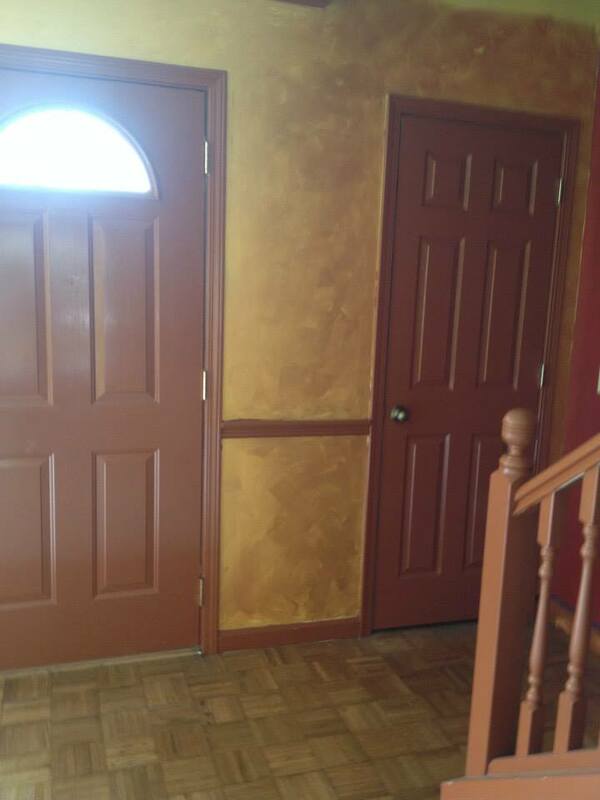 The wall color is Valspar’s Wet Cement! Girl, you amaze me every day! I have seen these pictures before, and I have seen what you’ve done in your other houses, but I’m still in awe of your talent. I need you to come into my house and help me!! I’ve got the plan in my head, but it’s just a matter of actually doing it. You are such an outstanding person and I am so proud of you! Awww…Becky, you are so sweet! I may just cry 🙂 Thank you! Wow is all I have to say! You’ve put together a beautiful room and showed us all a total transformation of spaces. What are the colors of gray and white did you use? 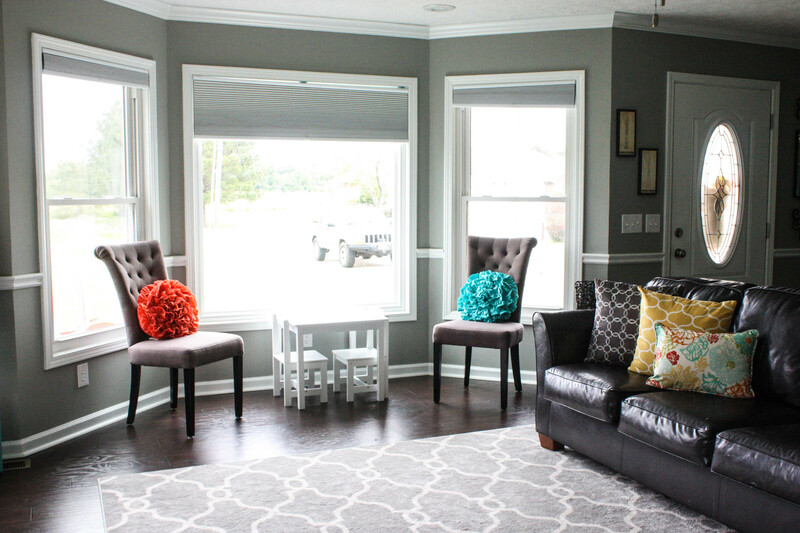 Did you use the same grays on the top and bottom of chair rail? Beautiful make over. Great job decorating too! 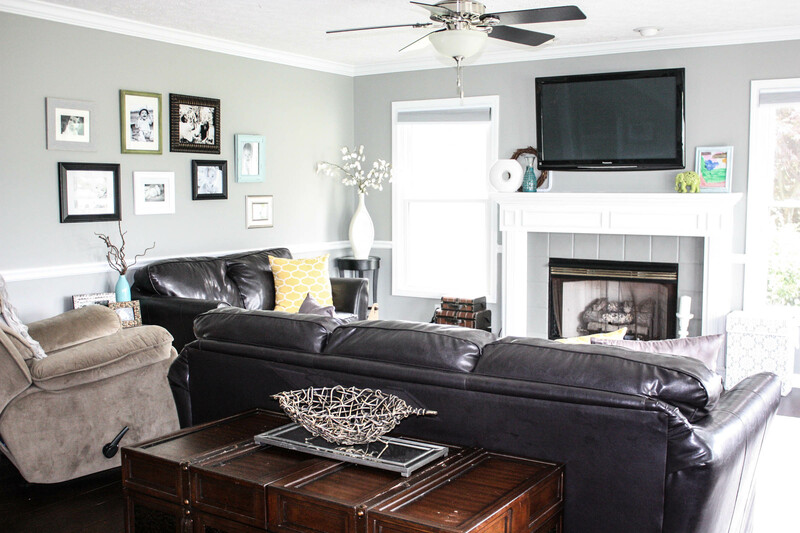 The white is a bright white, semi gloss latex…and the gray in the living room is called Wet Cement by Valspar. It is the same color on top and bottom. The lighting makes it look a little different, but it is all the same color. Thank you so much! WOW! this is absolutely gorgeous! I found your blog via hometalk and so glad I did! I have subscribed and can’t wait to see the rest of the rooms as you redo them. It would be hard for me to move from a home as beautiful as you are making this one! Thank you very much, Debbie! I am so glad that you are enjoying my blog! Thank you for subscribing. I am truly happy to have you. I love the room and the way it turned out. And, what is the name of the paint color? I’d love to use this in my dining room. It is Valspar Wet Cement. Great color! I love it. Thank you so much. The power and the beauty of paint and white woodwork, eh? You will sooooooo make a good profit on this flip! Thank you so much, Jenny!! I appreciate you taking the time to comment 🙂 It really means the world to me. What about the beautiful trunk/table you have behind your couch? Where did you get it? You have done an amazing job. I would love a room like this in my home. Are you couches brown? I can’t be sure from the picture. 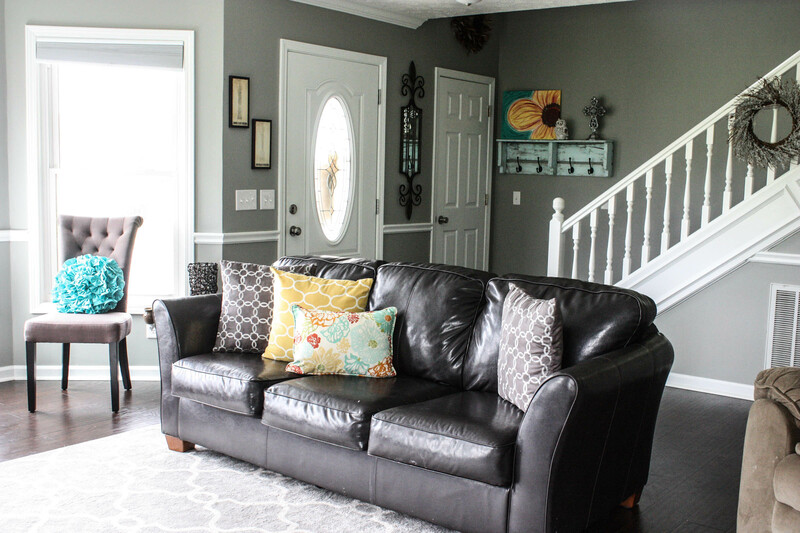 I’m asking because I love the gray walls but was told that it wouldn’t look right with my brown couches? Thanks in advance! Yes, they are brown leather. Well they look great in there! Glad to see that it will work for me!